Oh, the holiday season is upon us and one of my favorite things to do when wrapping Christmas presents is to watch holiday movies. I know everyone has their own personal favorites and there are plenty of newspapers and magazines that have lists… some of those I like, some I don’t. For example, I know many people think It’s a Wonderful Life is one of the best ever. Now I love Jimmy Stewart as much as the next person, but it doesn’t make my list. These are the movies that I usually watch some point each December. Mostly while wrapping presents, but sometimes curled up on a rainy weekend (like today) or after opening the presents. Just depends. 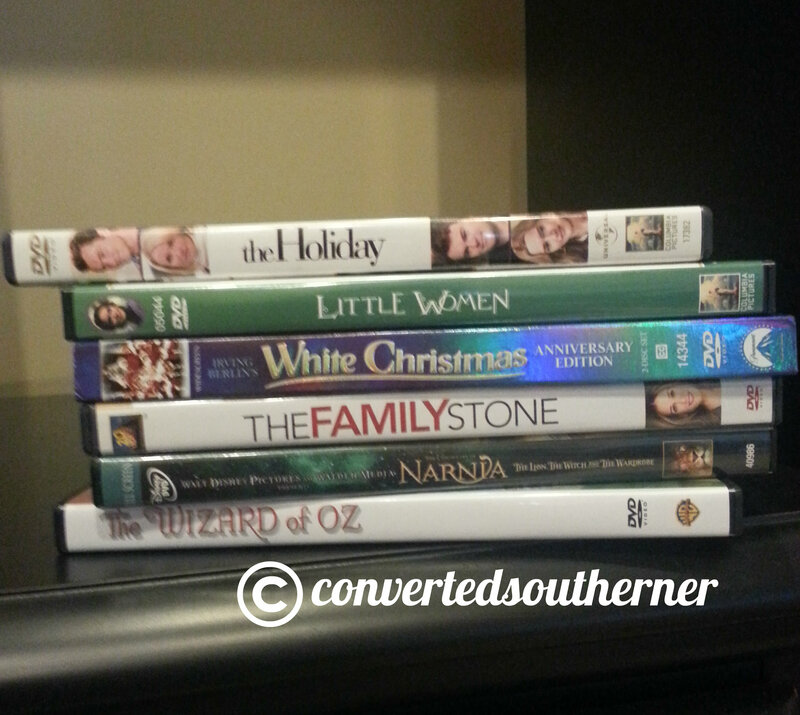 some of my fave holiday movies! White Christmas– I saw it for the first time in 5th grade and loved it because of the singing and dancing. It is probably my all time favorite Christmas movie. The Family Stone– This has been a favorite since I saw it in the theater. It is surprising that I like it so much because (Spoiler Alert), Diane Keaton’s character dies. I HATE it when people die in movies (well, not action movies, that is okay). But I love the ensemble cast, THAT HOUSE and the funny scene in the kitchen on Christmas morning. The Holiday– This movie makes we want to visit England in winter and we all know I don’t love winter. I love the movie, but I especially love the music! Such a good score. Home Alone– One of my favorite movies from when I was a kid. I totally remember seeing it in theater! Little Women– The 1994 version. Loved the story, love the 1860s set, loved it all. Oh, and the Orchard House instrumental is totally on my playlist. I just fast forward through that part where Beth dies. The Chronicles of Narnia– All three movies that have come out, even though only the first one has a Christmas scene in it. Love these and wish they would make the rest! There are some others I like: the Santa Clause, Santa Clause(1985) and couple of cute Lifetime or Hallmark movies. Those are more that I will watch them if they are on, not that I have to see them. What are your favorite Christmas movies?